I have been updating posts on Multiple Choice Questions to make sure all links are working correctly and any outdated resources removed. The posts Multiple Choice Questions and Multiple Choice for older students can be found on this new page, Multiple Choice Questions under Problems and Activities. There are many excellent sources of questions in these posts, Don Steward for example, who has so many outstanding resources on his Median blog, includes some multiple choice quizzes. See this on rearrangement for example. Note that Don has a collection of practice and quiz questions which includes multiple choice quizzes. A recent happy discovery is the excellent multiple choice questions from the American Mathematics Competitions (AMC). There are several competitions which increase in difficulty by student age. Detailed Problems and solutions are available, I do like this problem, a good one to use when teaching Systematic Listing Strategies perhaps. On TES resources, author pbrucemaths has a brilliant collection of clearly indexed multiple choice starter questions, Phil Bruce has aimed to cover every objective on the GCSE syllabus. 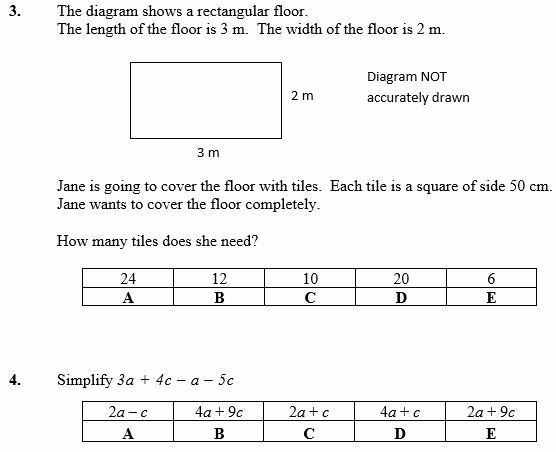 Also on TES, Colin Billet has created multiple choice questions from old GCSE papers, one set is for the higher tier and another for foundation.